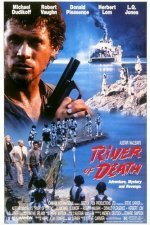 Adventurer Michael Dudikoff travels up the river of death in search of a woman and a Nazi scientist. Accompanying him on his quest is (a toupee-wearing) Donald Pleasence and a bunch of other people who all have their own agendas. This extremely violent and unpleasant action film, includes too many of the modern jungle movie clichés and the ending turns out to be particularly pointless. Just about the only fun to be had is the accent Robert Vaughn puts on in his role as the Nazi scientist.